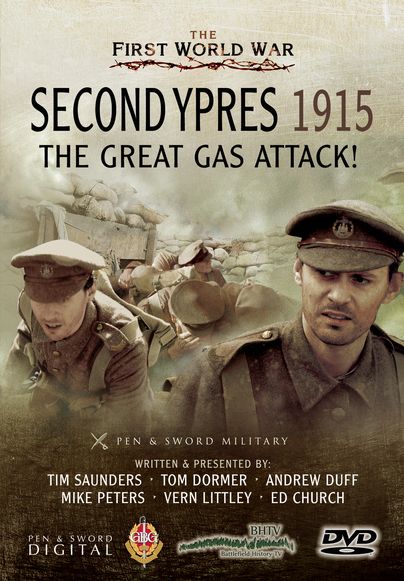 You'll be £16.99 closer to your next £10.00 credit when you purchase Second Ypres 1915. What's this? The Second Battle of Ypres was a battle of the First World War fought from 21 April–25 May 1915 for control of the strategic Flemish town of Ypres in western Belgium, following the First Battle of Ypres the previous autumn. It marked the first mass use by Germany of poison gas on the Western Front. For the first time a former colonial force (the 1st Canadian Division) defeated a European power (the German Empire) on European soil, in the Battle of St. Julien and the Battle of Kitcheners' Wood. In the now established BHTV style, Battlefield guides Tim Saunders and Andrew Duff join a selection of historians on the ground to explore the actions of Second Ypres and analyse the significance of what was the first former colonial victory on European soil. The team explain the bravery shown by the troops on the ground and the horrors they faced from the advancing German gas clouds. German casualties from 21 April–30 May were recorded as 34,933 by the Official Historians of the Reichsarchv. British casualties recorded in the British Official History were 59,275 men and the French had c. 18,000 casualties on 22 April and another 3,973 casualties from 26–29 April. Canadian casualties from 22 April – 3 May were 5,975 of whom c. 1,000 men were killed, the worst day being 24 April when 3,058 casualties were suffered during infantry attacks, artillery bombardments, and gas discharges.